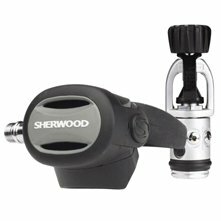 The Sherwood Scuba regulator is one of the most popular piston regulators in the world. While the Oasis regulator is not on the scale of the higher performing regulators, such as Atomic or Scuba Pro, the Oasis regulator from Sherwood will not cost you an arm and a leg to purchase. The Oasis second stage has a unique moisture retaining system. This “retaining system” is the same one you will find in the Sherwood Blizzard regulator. In the Blizzard it is called an “anti-freezing” mechanism. The design actually works great in both environments. The second stage has two heat retaining fins that collect a diver’s heat from their exhalation and warms up the air as it passes back through the fins on the inhalation. Once some poor young Scuba instructors took their regulators down to the Caribbean on a vacation and discovered the fins retained the moisture from their exhalation and the moisture evaporated off of the fins during the inhalation. Soon dive shops all along the Caribbean were ordering the Anti-freezing Blizzard, removing the environmental seal off of the first stage and selling the regulator as a solution to the ever resent “dry mouth” that all divers were suffering through. Once Sherwood discovered the reason why so many ice regulators were selling in the Caribbean, they soon adapted the first stage from a Brute Regulator and a Blizzard send stage and the Oasis was born. Today the Brute first stage has been upgraded to the Maximus regulator and the Oasis is Sherwood’s best selling regulator. 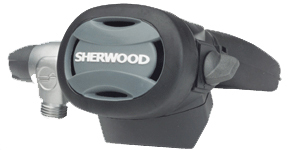 Sherwood also has the modern day Brute regulator, which can be found on our Sherwood unbalanced regulator page, and the Blizzard which is the same as the Oasis, except for the environmental seal to keep the first stage from freezing. Check out our ice diving regulator age for the advantages of this style of regulators. Lastly the Sherwood Maximus regulator, which has the same performance features as the Oasis, but includes an underarm swivels system to reduce jaw fatigue.